View of St John's Church, under Lewes Castle. The old church of St John-sub-Castro was built within the walls of the original Anglo-Saxon fort on the site, and has a blocked up Anglo-Saxon doorway. The chancel arch has an inscription in Lombardic script marking the burial of a member of the Danish royal family here. 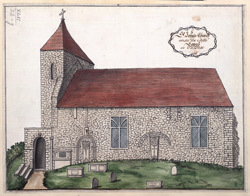 The inscription was copied and translated in Camden's 'Britannia', which may explain why this church attracted antiquarian visitors and topographical artists.